DISCLAIMER: Los Tweens was provided complimentary tickets to attend a Cirque du Soleil performance. All opinions are certainly our own. During a recent #FamiliaTravel tour of Utah’s Bryce and Zion National Parks, we carved out time for a fun day-trip excursion to Las Vegas. I reached out to the folks at Cirque de Soleil to research which shows are best for families and they immediately suggested Mystique. I’ve been a Cirque de Soleil fan for a long time having seen various shows when they tour Miami. In one word, the show was “fantastic!” Funny, engaging, unique and clearly entertaining, the performers had our attention for the full 1.5-hour presentation. And the kids were certainly engaged. They specifically asked us to purchase the music CD because they simply loved it. Loving music that is classical based and moving? Siiii- I’ll buy that! With tickets ranging between $25 – $100- the outing may have to be considered a ‘special occasion’ for some families but the experience certainly is worthwhile. What I like about live performances that include a live musical component is that it forces children to listen and interpret the performance, and feel the musical connection to the actors and performers. Of course what is so unique with Cirque de Soleil shows is the combination of acrobatics, acting, music and trapeze that easily flows from one scene to another. At one moment we were entertained by an adult male looking for his ‘mama’ in the audience dressed as a rather over-sized baby that was very funny. Then the audience was emerged in the ridiculously difficult balancing act of two male acrobats all while your spirit is drawn into the amazing music. If you have an opportunity to visit Las Vegas and see Mystique with your family- I highly recommend it. If you’re looking for a local Cirque de Soleil show, check out their website for the traveling performances. Para datos sobre los precios y actividades atraves del pais- visita Cirque de Soleil en Espanol para EE.UU. You can call or write them to get suggestions as to which shows are more family friendly. 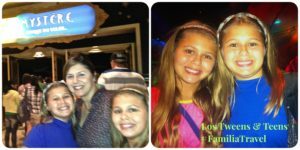 This entry was posted in Travel and tagged #FamiliaTravel, Cirque du Soleil, familia, padres, teens, travel, Tweens. Bookmark the permalink. issue just before that as well turns into uninteresting. Greetings! Very helpful advice within this article! It’s the little changes that will make the most significant changes.